The power of The Cloud has brought a whole new dimension to how we go about running our everyday digital errands. As far as note-taking is concerned, Evernote is seen as the go-to option, as it provides a wealth of features while also offering seamless, automatic syncing to any and all of your devices. 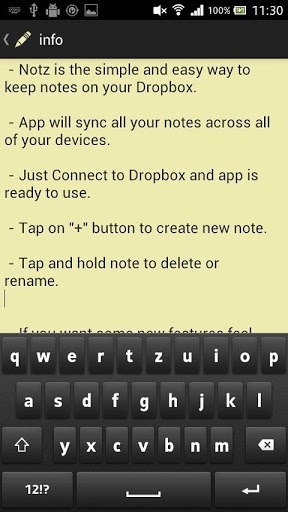 If you’re looking to break away from convention, and instead try another app for the jotting and syncing of notes, you may want to give Notz for Android a try. It’s incredibly small (less than 600kB), works nicely with Dropbox, and has a pretty interface. Oh, and it’s absolutely free of charge. 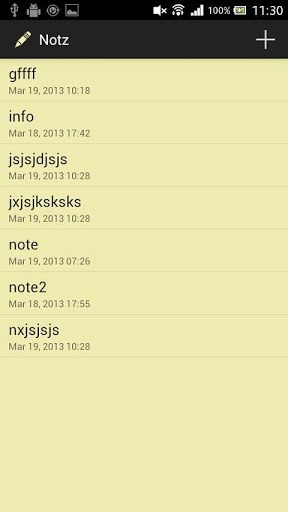 In terms of categories of apps for mobile devices, note-taking is a pretty crowded one at that. There are perhaps thousands of options out there purporting to make the process of jotting down quick thoughts and important prompts a relative breeze. But Notz is particularly noteworthy because it manages to pack all of the required features into a very small parcel, and with a nice, minimalistic Holo interface, we thought you may like to take a closer look. Compatible with Android 4.0 (Ice Cream Sandwich) or higher, it was created by XDA-Developers member xdpp, and not only can notes be quickly and conveniently be taken down, but the syncing through DropBox with your PC, tablet, or other smartphone is just as simple. It’s one of those apps you can just pick up, and almost instantly, you feel familiar with it. The UI of some note-taking apps seem to fall victim to the Unnecessary Clutter Brigade, but with a clear reference to all of your notes (plus a convenient symbol to get you started with new ones), Notz is as clean as possible. Once you’ve synced notes to Dropbox, any other Android device with Notz installed can view, share, and edit; while on the PC, you can view notes as simple .txt files. As aforementioned, it’s free to download over at the Play Store, and we’ve provided a link below. It’s pretty no-frills, but if you want an app to do one job and do it well, rest assured Notz will have you covered. Although, we would prefer Google Keep over any third-party notes app at this time, but it’s always a good idea to try different alternatives before landing on the ultimate one.